An innovation for cabinets and shelves: the Cabinet LED Slim under cabinet luminaires combine an especially slender design with powerful light intensity of up to 980 lm. The uniform light distribution is extremely convenient thanks to edge-lit technology and the IR switch, which can be used to switch the light on and off simply using tapping or swiping gestures with no contact needed. The light also dims continuously by holding your hand close to the switch for more than a second. The Cabinet LED Corner under cabinet luminaires bring light to the furthest corners of cabinets and shelves. They can be installed easily without visible screws and shine with bright, uniformly distributed light. An especially innovative feature is the sweep sensor – an infrared switch that allows the luminaire to be switched on and off and dimmed continuously with no contact needed. Cabinet LED Panel luminaires have everything demanded of modern under cabinet luminaires: not only do the 7.6 mm flat low-voltage panels impress thanks to edge-lit technology with especially uniform light distribution, they can also be installed easily without screws or adhesive and can be operated via an IR sensor with no contact needed. It goes without saying that they also have a continuous dimming function. This 18 mm fl at high-voltage under cabinet luminaire sets the mood perfectly. The RGBW variants with remote control not only illuminate in warm white, but also in a wide range of colors on request. Two further variants for white light can be operated contact-free thanks to their sweep sensor (IR). Furthermore, up to 10 luminaires can be combined with one another in the 30 cm variants for example. Installation is child’s play too: using screws or adhesive tape. If you’re looking for homogeneous lighting for your workshop, kitchen or bathroom, look no further than the products in the Linear LED Corner series. These energy-saving luminaires with aluminum casing provide comfortable, bright light in your workspace. You can connect up to 15 Linear LED Corner luminaires to create enough light for even large workspaces. Even better: the Linear LED Corner series also includes accessories such as USB ports and Bluetooth speakers, ensuring you get not just sufficient light, but also a uniform look and feel throughout your workspace. Under-cabinet luminaires in the Linear LED Turn series can be installed anywhere there’s a socket. The LED luminaires have a hard-wearing aluminum body and are suitable for use in workshops, hobby rooms and garages. 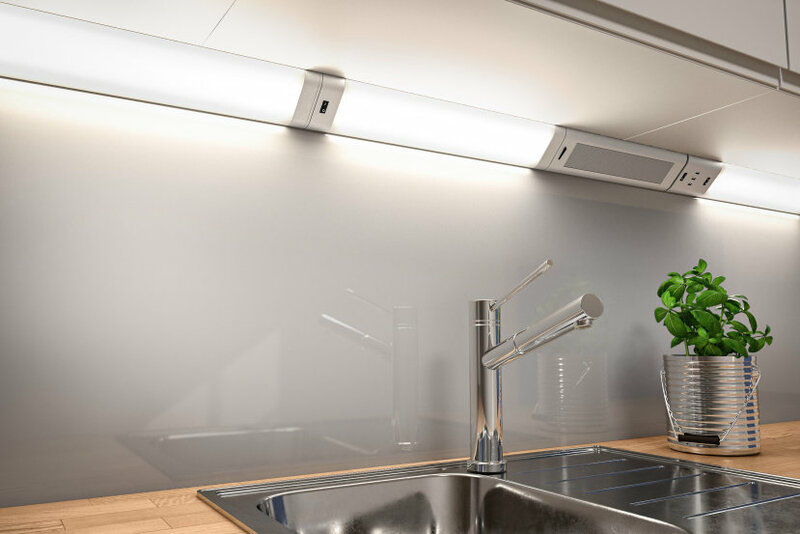 Another highlight of the Linear LED Turn under-cabinet luminaires is that you can easily adjust the angle of the light. You can also connect multiple LED elements to provide enough light for larger workspaces. The Linear LED Turn comes in two lengths: 357mm and 557mm. 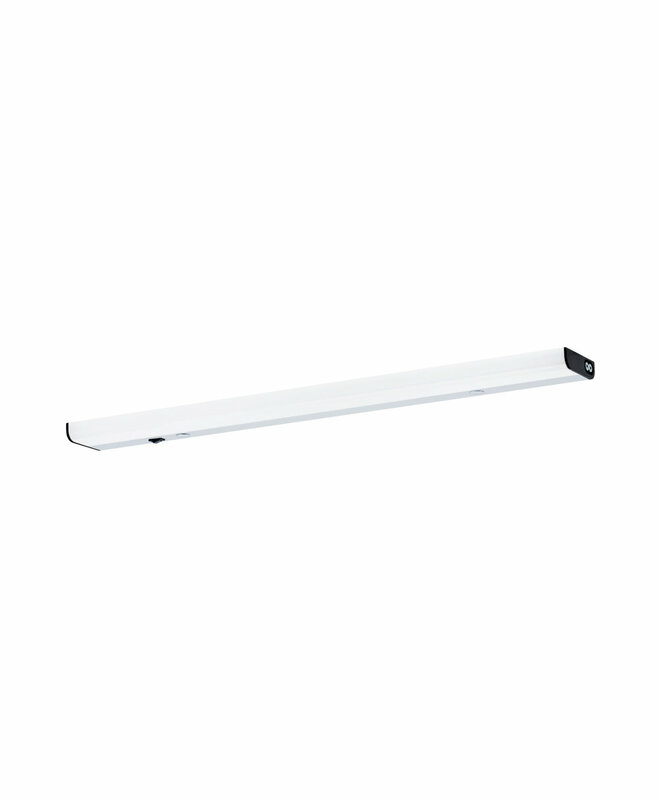 Whether it’s in the kitchen, bathroom, wardrobe or workshop, the Linear LED Flat under-cabinet luminaire evenly illuminates shelves and can also be used to light other items of furniture. Its elegant, modern aluminum body is a subtle eye-catcher, while its integrated LED module saves energy and boasts a long lifespan. 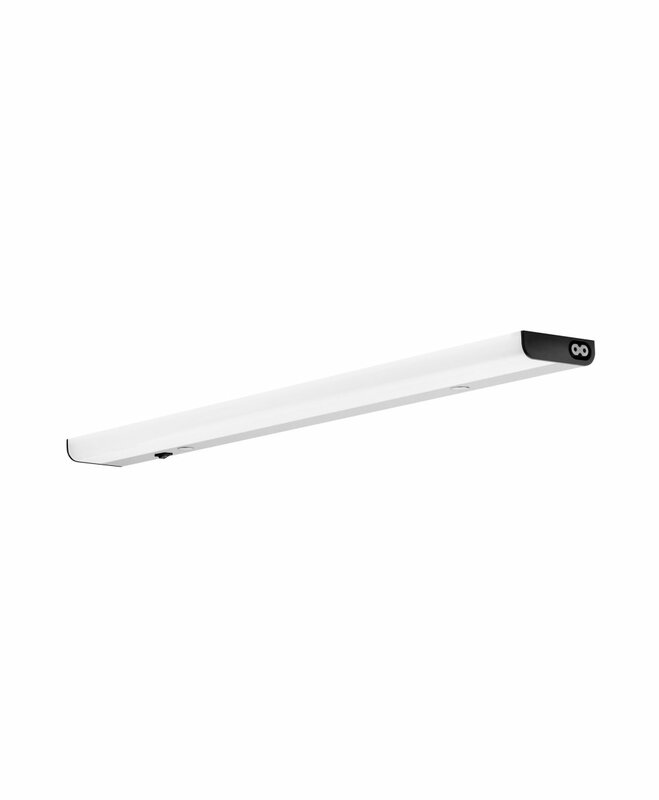 The Linear LED Flat under-cabinet luminaire is available either as a switch-operated ECO-version or as a practical sensor version for touch-free control. You can also choose from a variety of lengths and color temperatures (warm white and cool white) and have the added option of connecting multiple under-cabinet luminaires together to ensure you get all the light you need.